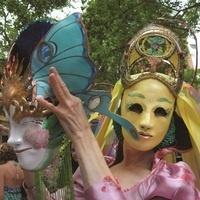 The Art Parade is a vibrant celebration of the creativity and spirit of FestivALL. Join us as visual artists, theatrical groups, dancers, street performers, art cars, music makers and local organizations parade down Capitol Street from Kanawha Boulevard to the post-parade party at Capitol Market. If your event is taking place during FestivALL, this is the perfect time to get creative and promote your event! FestivALL 2019: June 16-30, 2019, and watch the capital city of West Virginia become a work of art!